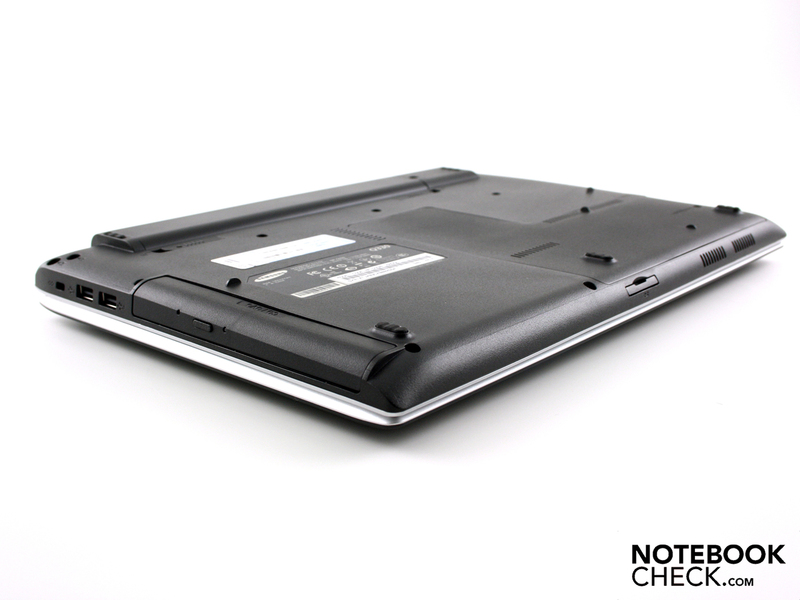 We always appreciate seeing 13.3 inch notebooks in for our tests. The handy devices with a weight of slightly more or less than two kilograms are commonly seen as a compromise of backpack suitability and performance. Samsung's QX series (unlike Q series!) started off in December with the QX310-S02DE. 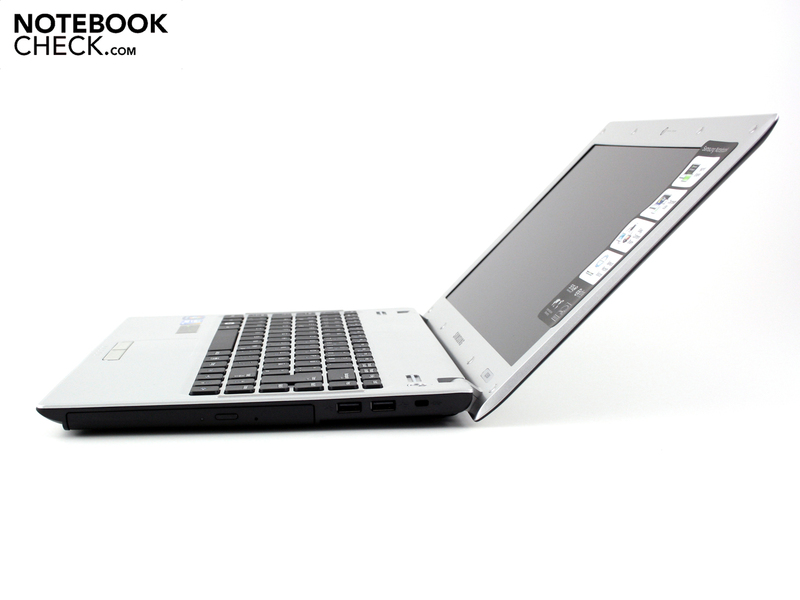 With a completely different case and a Core i5-460M, the QX is designed for performance and with elegant looks. The price of 999 euros is accordingly exorbitant. The less expensive Q series, with slightly inferior performance, can be seen as the QX's smaller mainstream brother. 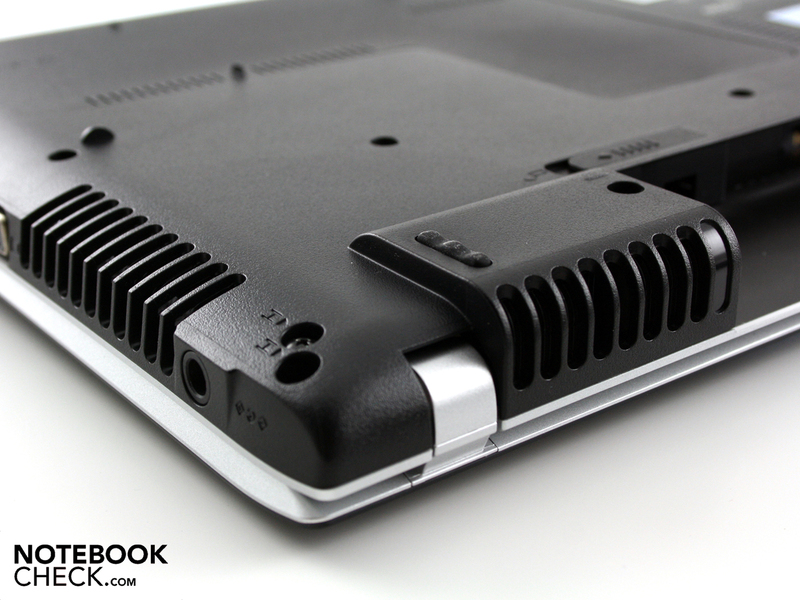 High-end plastic instead of aluminum, a Core i3 instead of i5, a less solid case and a standard touchpad. In return, prices start at 735 euros ("silver"). 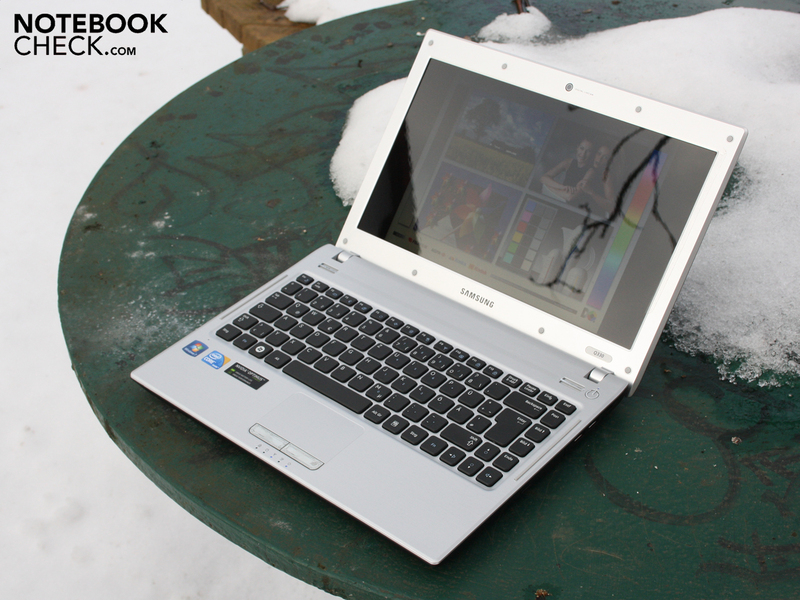 Find out in this review, if the subnotebook qualities are still up to date. but isn't completely resistant to twisting. The matt, slip-free work surface is pleasant. The matt, yet silver shimmering surfaces (interior) make a workplace apt impression. The 13.3 incher has been given a fingerprint-free zone. The lid looks like the usual high-gloss finish from a distance and on most pictures. It is however a brushed finish with aluminum looks. The thin horizontal stripes are on the top and provide good grip. 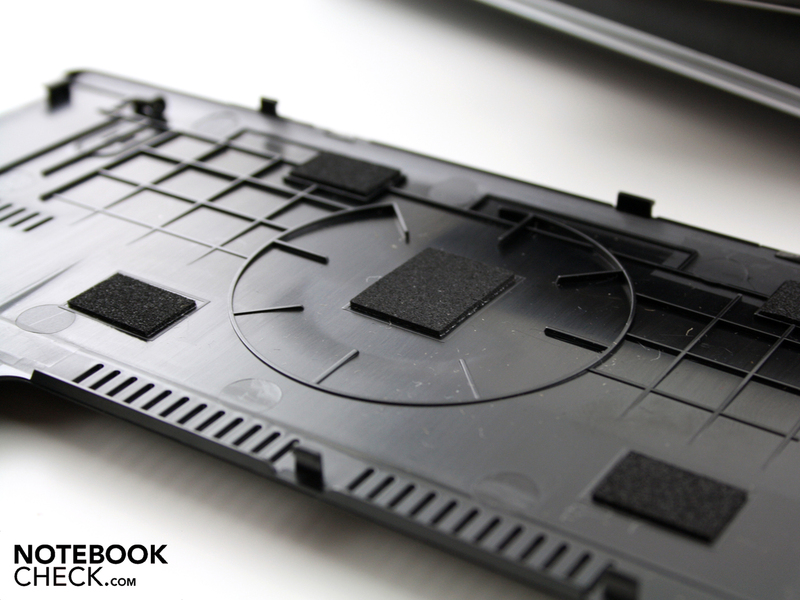 We consider the fact that the surface isn't as susceptible for scratches and fingerprints more important. Logical: If lengthwise scratches are standardly included, a few additional scratches won't be noticed either. The 13.3 incher, plus the 247 gram adapter adds up to a weight of 2019 grams. 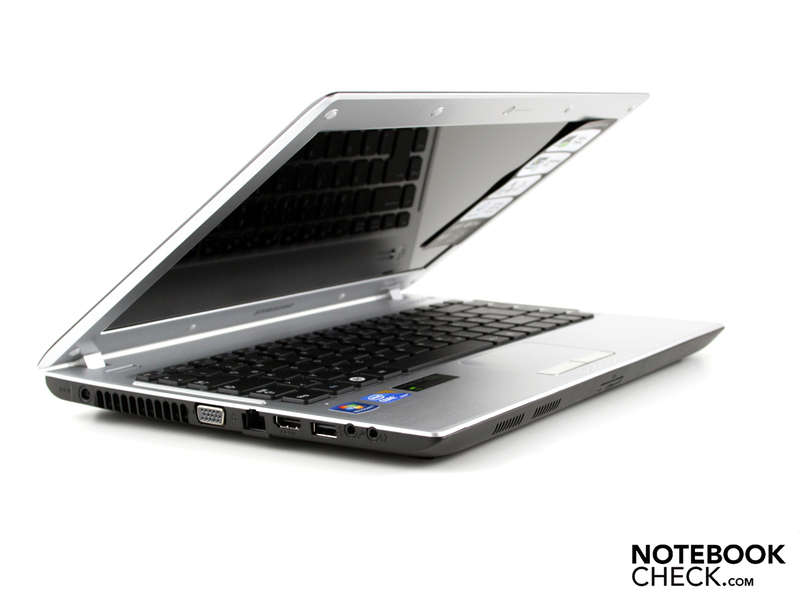 It is almost 500 grams heavier than Dell's Vostro V130, which is completely made of aluminum. 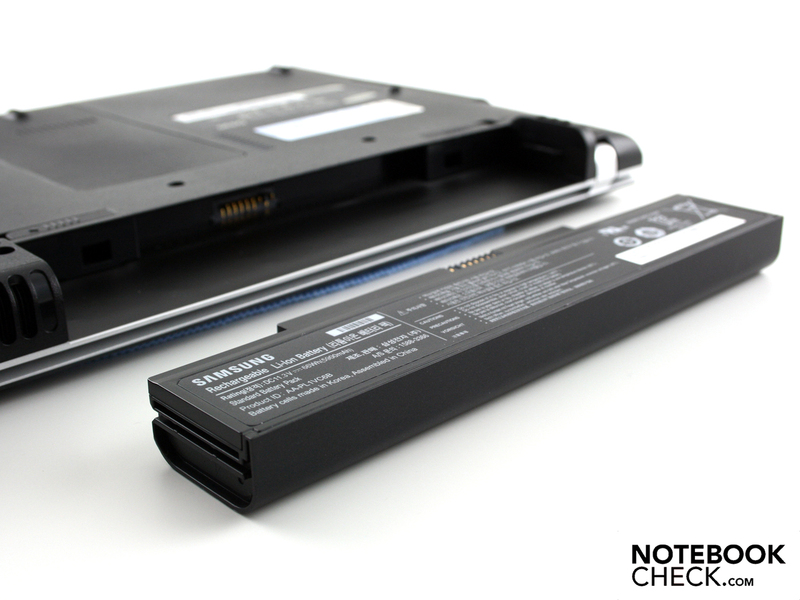 However, its two kilograms are still acceptable in view of the strong 5900 mAh battery. 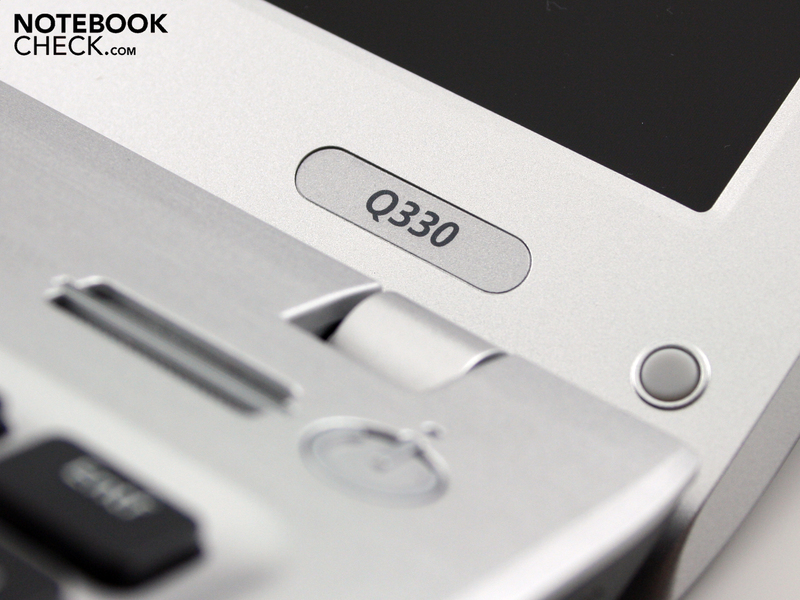 Even if the similarity in name with the QX310 may indicate it, both barebones are completely different. 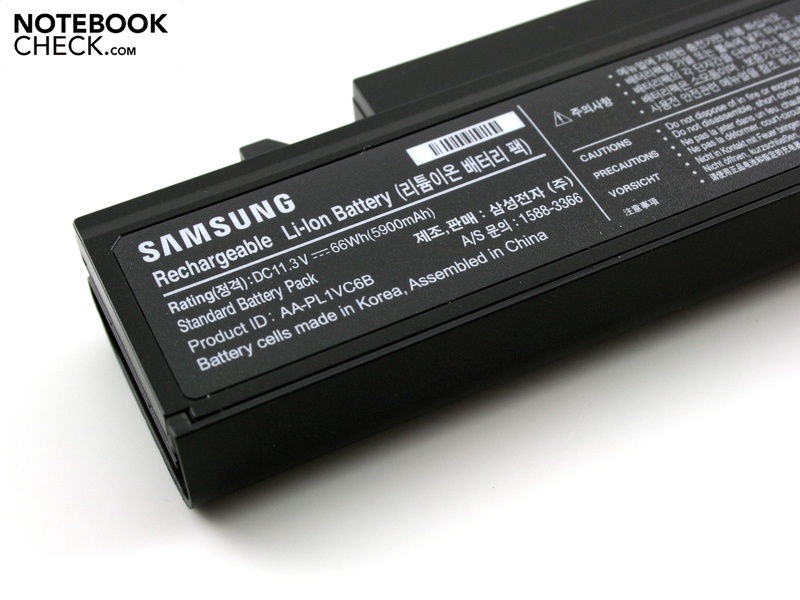 Port positioning, design, surface and the battery's incorporation (QX310) vary clearly. The hinges hold the lid securely and don't tend to teeter. The maximum opening angle of about 135 degrees is sufficient for working on the lap. The lid coils a bit at the maximum opening angle and we notice that it sits a bit spongy on the base unit. We can bend the base unit to an extent with two hands holding the sides. The plastic base plate doesn't start to creak though. The lower surfaces dent over the optical drive and the maintenance cover (center) when pressure is applied. 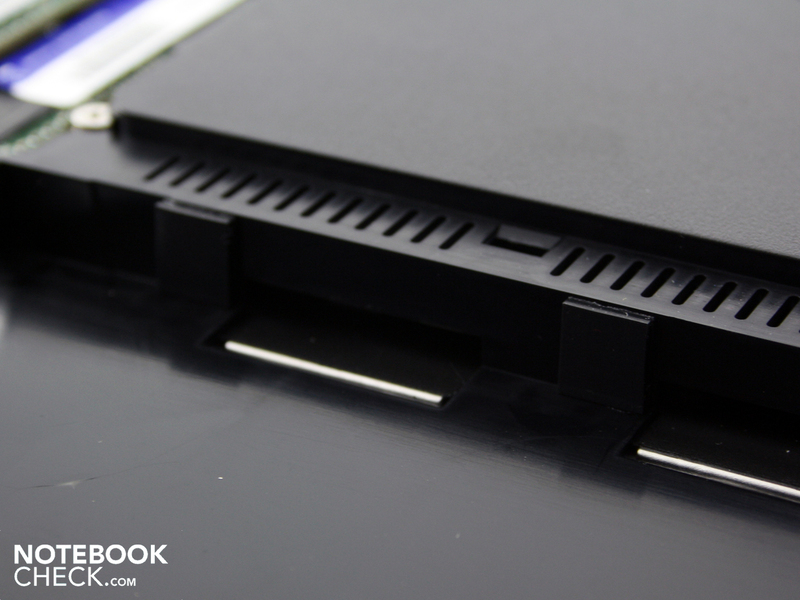 The 2.5 inch hard disk and the DDR3 RAM module (two bays, 2x2GB) are found underneath the cover. The wrist-rest and touchpad prove to be solid. Even stronger force can't provoke any yielding at all. The hands rest without slipping on the surface and don't produce any fingerprints. Connections aren't one of the Q330 Suri's strengths. 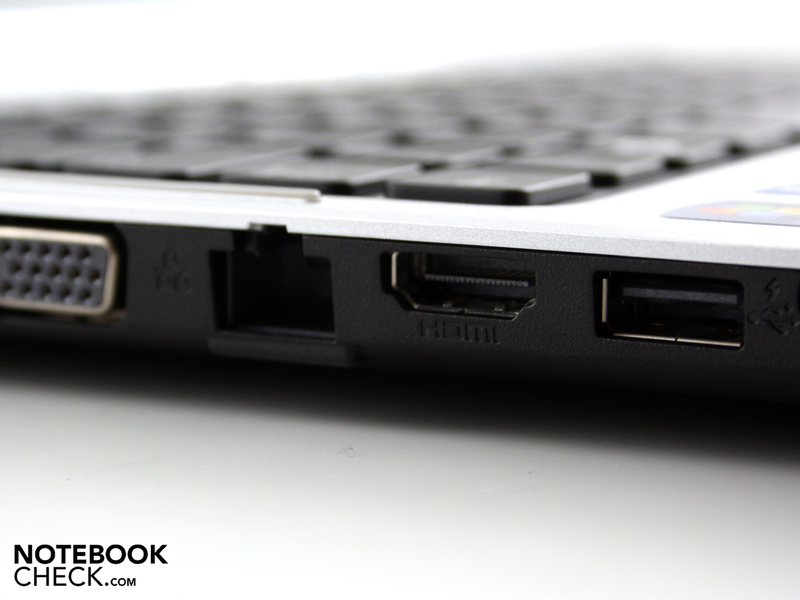 Mouse or USB hard disks have to be content with the three USB 2.0 ports. eSATA, ExpressCard34/54, USB 3.0 or even a docking port aren't installed. External monitors can be connected via HDMI or VGA. The positioning deters the cable mess on the desk to an extent. The DVD drive is on the right's far front. Two USB cables can be lead around the back. The unwieldy HDMI, VGA and Ethernet cables are unfortunately in the left front area. The cables might collide with a left-hander's mouse here. The Q330 doesn't have a docking port. Consequently, the only option is USB port replicators. 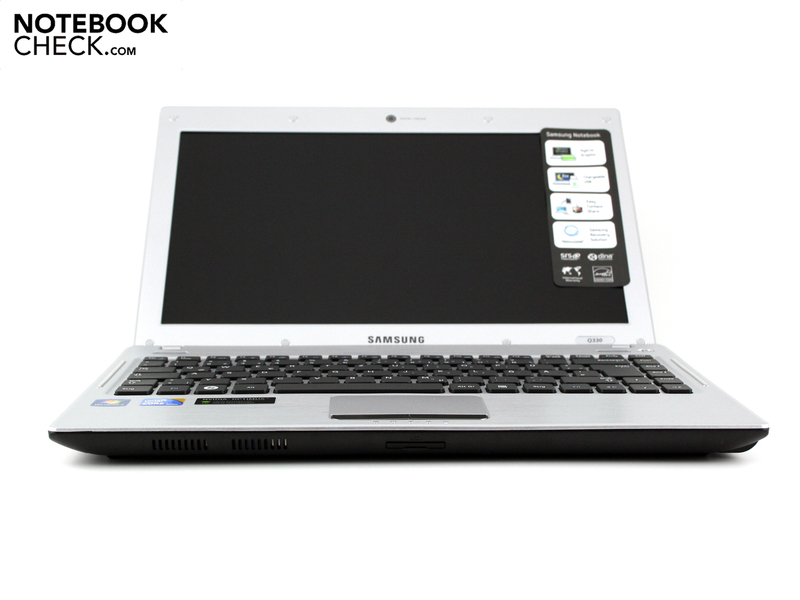 The only wireless technology in the Q330 is WLAN draft-n (Atheros AR9285) (no Bluetooth). The Marvell Yukon 88E8040 Fast Ethernet controller can't transmit data with the fastest possible gigabit speed in the home network. Thus, the lack of a HSPA module for mobile internet access isn't a wonder with this economy configuration. There aren't any recovery DVDs included for Windows 7 Home Premium (64 bit). 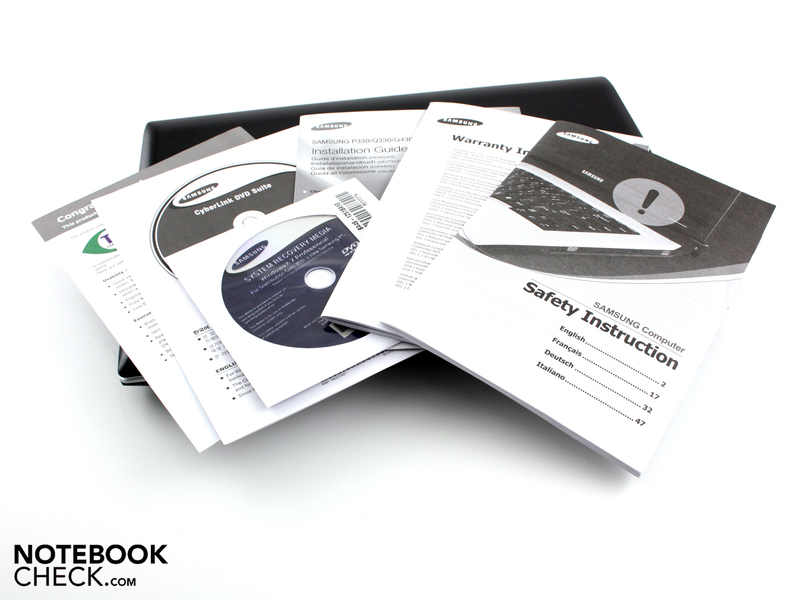 Buyers should therefore burn the corresponding DVDs with Samsung's Recovery Solution 5. Samsung as always bids a selection of well-arranged notebook tools. Among others, ChargeableUSB (charges your mobile via USB), Easy File Share (file sharing with other PCs), Easy Network Manager (set up WLAN locations) or Samsung's Update Plus (driver updates). Battery Life Extender, which limits the battery load to 80%, seems to make sense for extending the battery life. Easy Speed Up Manager (FN+F8) occasionally cleans up the registry data base. A 24 month manufacturer's warranty is granted (incl. onsite). Samsung calls its standard warranty extension Guarantee Plus. It's available for about 50 euros including a 3 year onsite collect service (starts on date of purchase). The detached keys are embedded (no tray) into the silver work surface, which is made of one piece. 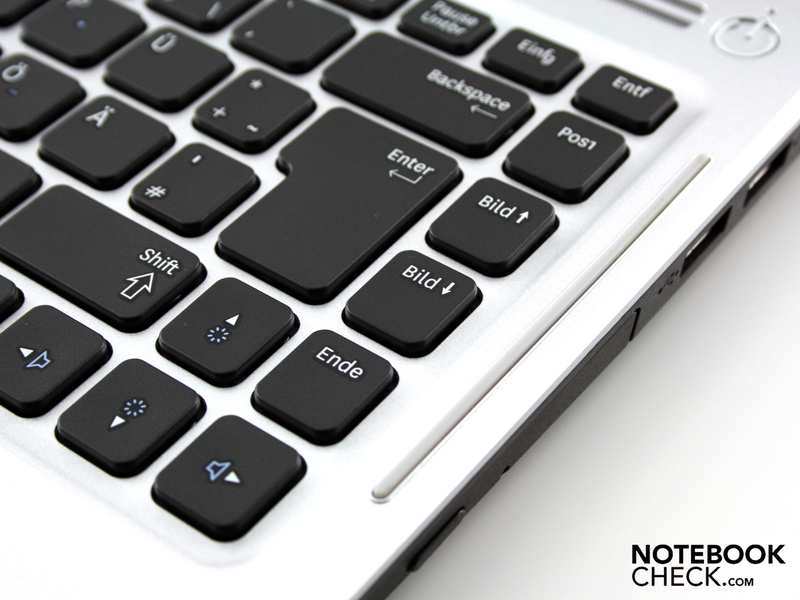 Pressed keys are level with the surface and make cleaning easy. The layout is generous since there is no number pad. Typing accurately on the keys is possible without an accommodation period. The key drop is medium-short over the entire width and the keystroke is firm. This was noticed adversely in the QX310 sister model. Unfortunately, the keys' somewhat imprecise pressure point has been maintained. However, it lessens the typing quality only marginally. The mouse pad (Synaptic Touchpad V7.4) can't continue to keyboard's good work suitability. 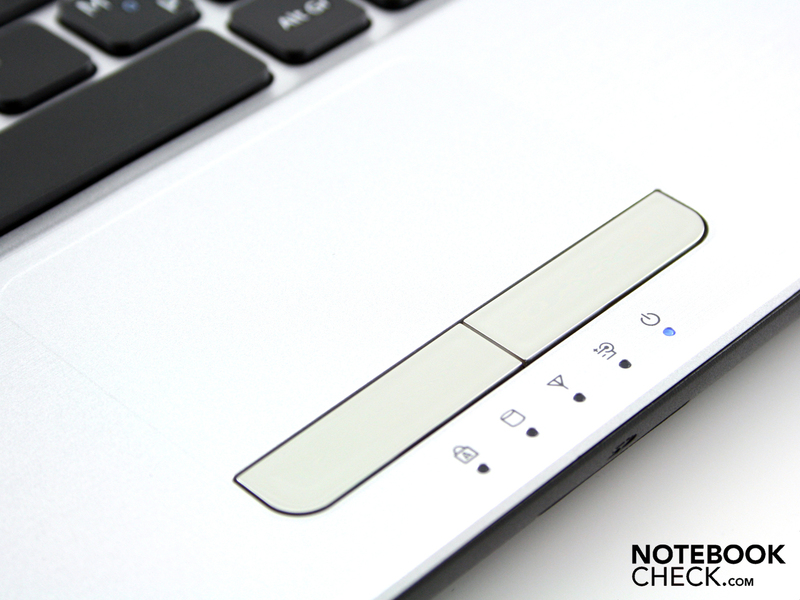 The cursor moves accurately on the desktop when we glide over the smooth surface. A narrow edge separates the sensitive surface from the wrist-rest. It doesn't differ clearly enough to ascertain the surface with closed eyes. The short key travel prevents good feedback when clicking fast. Although the noise is not loud, it makes a low-end impression. 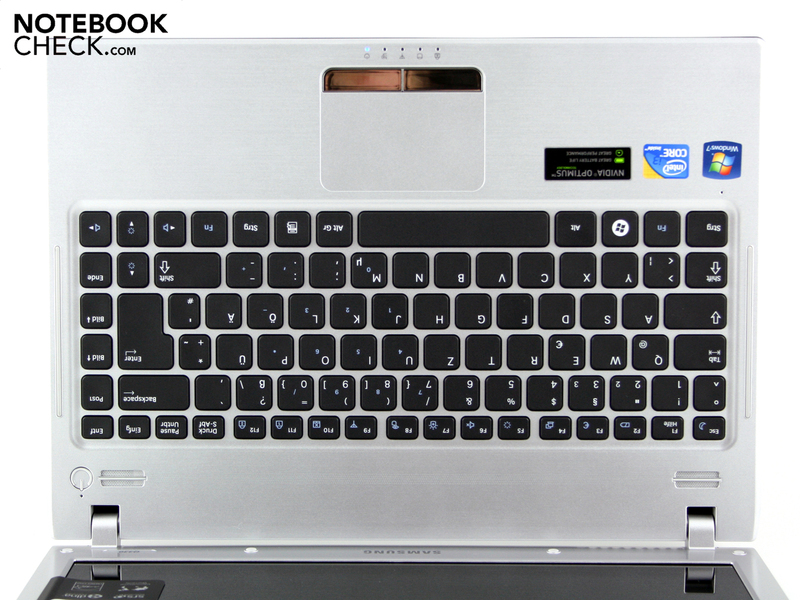 It is a multi-touch pad that recognizes two finger use (two finger gestures, e.g. zoom in, zoom out, scroll). There are vertical and horizontal scroll bars, even if they aren't visibly marked. 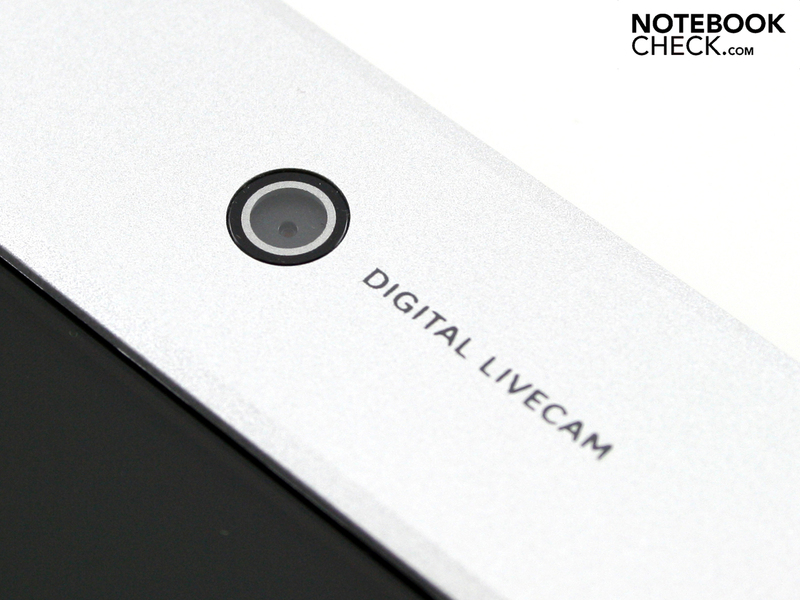 The sensitive surface is neither very big nor touch sensitive up to its corners / edges. Users can enlarge the field by disabling the one-finger scroll bar. 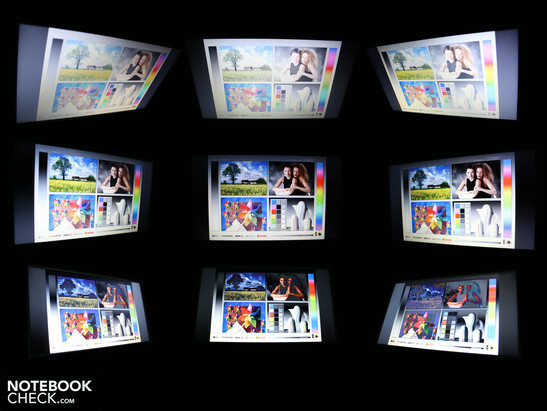 The reflective LED screen (model: SAMSUNG LTN133AT17000) has a resolution of 1366x768 pixels (16:9). The WXGA resolution is standard for 13.3 inch devices. The determined black value of 1.96 cd/m2 supplies a poor contrast of 146:1. Consequently, black is not deep black. Colors don't look as brilliant and fresh as it would be possible. The glare type quality compensates this drawback to an extent by prettying it up visually. The screen is inacceptable for pros because of the low resolution and the glare type. The color spectrum is very limited. It is far away from Adobe RGB 1998 (t). The same applies to sRGB (t). We place a very good pro display from the MacBook Pro 13 2010-04 (t) beside it for comparison. We assess an excellent average brightness of 281 cd/m2. Our light meter records a maximum of 287 cd/m2 in the center. This luminosity is perfect, especially in view of the targeted mobility. 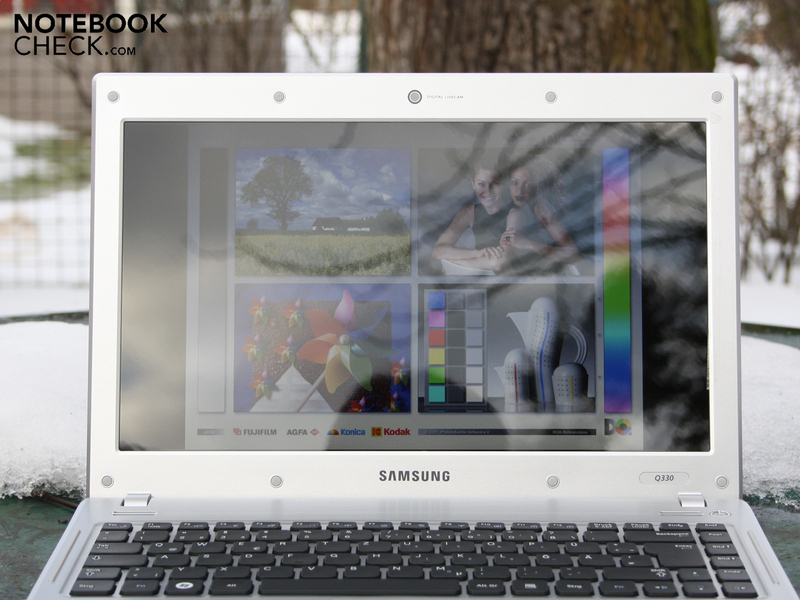 Merely (estimated) 5% of our test notebooks (all categories) have such a bright screen. The brightness is not reduced in battery mode. 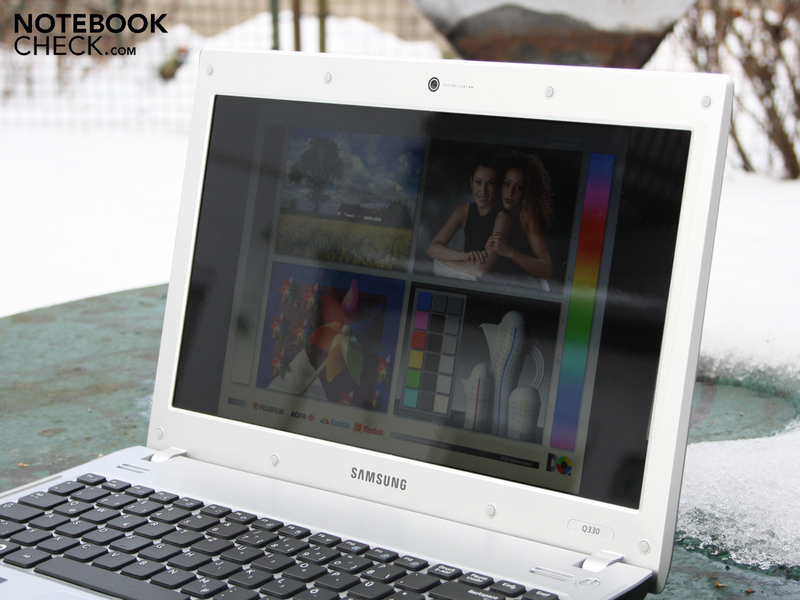 The 13.3 inch TFT provides only an adequate suitability for use in sunlight despite its great brightness. The desktop is well visible, but the reflections cause annoying restrictions in terms of legibility. The pictures were made in slightly overcast conditions in winter. The Q330 proves to have tight viewing angles. Ghosting turns up at 20 degrees when the eyes swerve upward or downward (vertically). We can deviate from the center up to 45 degrees right or left from the center (horizontally). The colors invert clearly beyond that. The Core i3-350M (2x 2.26 GHz) belongs to the weakest Intel Core i CPUs and is used in office notebooks or budget subnotebooks. In terms of performance, the 35 watt CPU (TDP) is stronger than the Pentium (P6000/P6100). In opposition to the latter, the i3-350M has the advantage of Hyper Threading (HT). HT supplies every physical core with a virtual core. The native i3 dual core thus can process four threads. The graphics card (Intel Graphics Media Accelerator HD), alike the memory controller, is incorporated in the CPU bundle. This allows a link with the dedicated Nvidia 310M in form of Nvidia Optimus. This feature makes it possible to switch between the Intel HD and the 310M automatically. The benefit is allegedly a longer battery life. 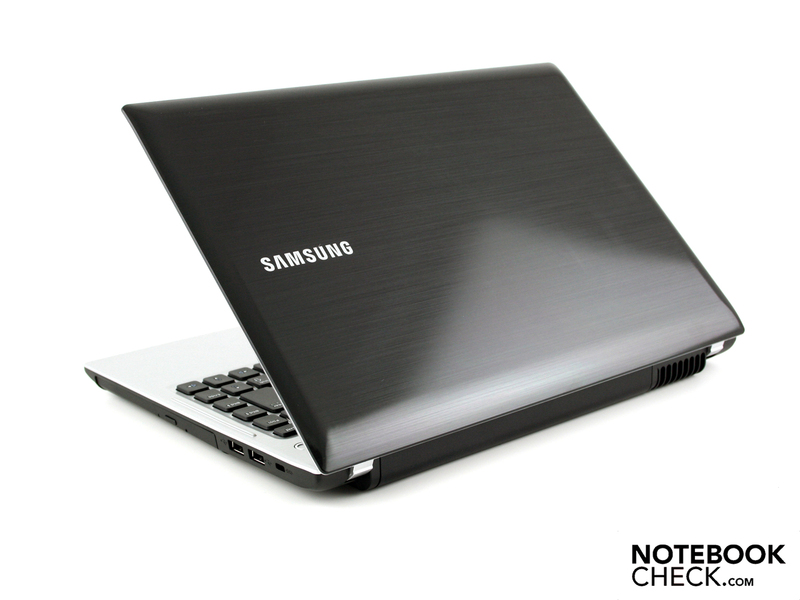 No delays or black, flickering screens turn up during the seamless switch. The Core i3-350M is supported by four gigabyte of DDR3 SDRAM. This total is on two modules and can be easily upgraded via the accessible RAM bay. 4 GB are standard for Windows 7 systems (64 bit in this case). The Core i3-350M (2.26 GHz) is weaker than its brothers, i5-520M or i5-430M. The processor test, Cinebench R11.5 (64 bit), rewards 520M laptops about 2.2 points and 2.0 points are given to 430M CPUs. The i3-350M achieves a lower score of 1.88 points. The difference isn't any greater despite the lower clock rate due to Hyper Threading. The i3-350M's 2.26 GHz are inferior to the identically clocked i5-430M in single core calculating because it doesn't have Turbo Boost. The latter achieves up to 3362 points (Cinebench R10 Single Core 64 bit, Sony Vaio VPC-EB1S1E/BJ). The 350M in the Q330 reaches 3183 points. But what about the system performance where the CPU is not the only active component (albeit the most important)? The i3-350M system scores 4362 points in PCMark Vantage. 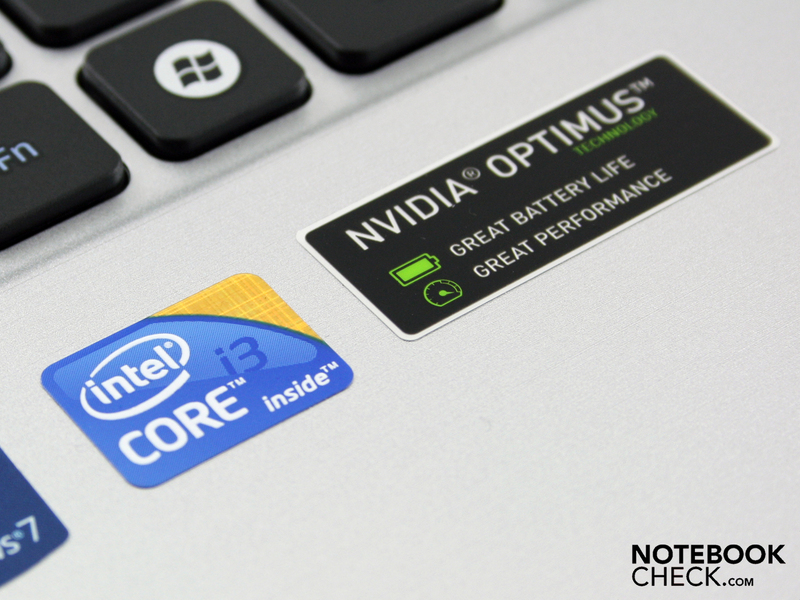 i5-430M laptops are only inferior when they have a sole Intel HD graphics. i5 systems are faster together with a dedicated GPU at any rate: 4900 to 5800 points (average approx. 5100 points). The Nvidia 310M graphics card only helps our system attain a few rating points. Applications that benefit from the 310M's hardware support (CUDA, DirectX Compute, OpenCL, H.264) work a bit faster, which PCMark Vantage also acknowledges. PCMark Vantage rewards a fast hard disk lavishly. The HDD sub score is around 3000 points. This is an average rate for a 5400 rpm HDD. Fast 7200 rpm hard disks can reach up to about 3500 points. The hard disk (500 GB) from Samsung reads with 66.4 MB/s in sequential read. The burst rate of 97.4 MB/s is fairly high (read from HDD cache). The HDD is only audible during use when the fan is turned off in idle. Now we can hear the quiet whirring. 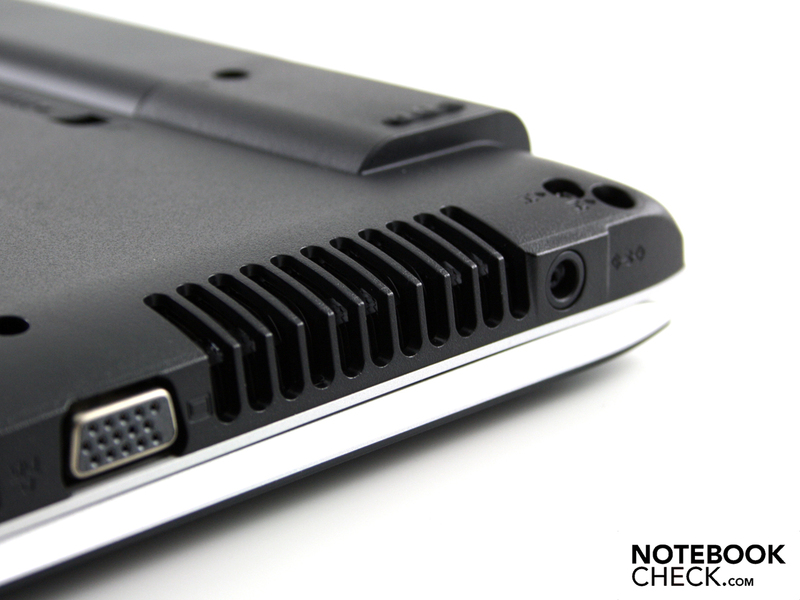 The write and read heads are only audible during activity when an ear is placed on the laptop. 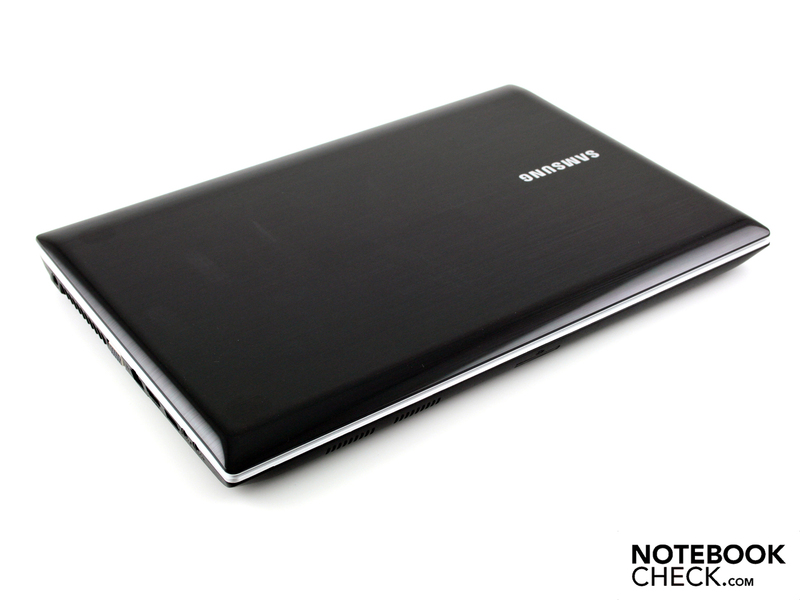 Samsung laptops have become famous with ergonomic top rates. This is also the case in the Q330 Suri. If you sit back and listen to music while decoding videos for your smartphone, you'll not be disturbed by a loud fan. We just only measure 33.4 dB(A) during 3DMark2006 (GPU load). Samsung's Silent Mode wasn't even enabled for this. We occasionally believed the active fan had shut down completely in idle. It however continues to rotate in the slowest speed and emits a just still measureable level of 31.7 dB(A). When Samsung's Silent Mode is enabled (FN+F8), the active fan even permanently turns off completely (idle). In this case, only the HDD's quiet hum is left. The Q330 even passes the stress test, where both CPU and GPU are fully loaded, with flying colors: a maximum of 38 dB(A). The fan doesn't vary its speed. After the load is finished, the fan quickly turns down to 32.4 dB(A). We can actually only praise the Q330 in terms of waste heat. The surfaces only heat up by 5 degrees under maximum load (top / bottom). The case's top had a maximum of 34 degrees after a two hour stress test with Furmark and Prime95. The base plate can still be used on the lap because we measure 42 degrees at most, but only at two of nine points. The load average is an easy-going 30 degrees (bottom). The top and bottom don't heat up beyond 30 degrees during normal use with a lot of idle use. We selected the standard mode for the idle temperature graph (constantly active fan). The case heats up stronger in the usually noiseless Silent Mode (CPU limited to 930 MHz) due to heat accumulation. This isn't dangerous because the fan becomes active at a specific temperature despite Silent Mode (temporarily). (+) The average temperature of the palmrest area of similar devices was 28.6 °C / 83.5 F (+4.1 °C / 7.4 F). Two stereo speakers are located above the keyboard. The sound is focused on the midranges and strongly neglects the high and low ranges. There is no bass. At least the volume can be turned up without scratching. The SRS sound enhancements should be left enabled in any case because the sound otherwise gets tinny. External speakers can only be connected to the analog 3.5 audio out (headphone). Our speakers (YST-M20SDP) receive a static-free, moderately loud level (audio test, no measurement). The manufacturer promises "the 6 cell battery supplies a runtime of up to 7.0 hours". We even achieved 7:53 hours (473 minutes) with the Q330. This is a less relevant idle runtime for practical use though (BatteryEater Reader's test). The notebook was permanently without CPU/GPU load, set to the lowest brightness and WLAN was disabled (Intel HD enabled). The 13.3 incher lasts for four hours (240 minutes) in WLAN surfing. The 60 watt adapter needs 2:51 hours for recharging. Movies can be played on the go with the optical drive. The DVD test lasted for over four hours (258 minutes). The Q330 thus has met our expectations on a good battery life. The 5900 mAh (66 Wh, 6 cells) battery is one reason for this. Another is Nvidia Optimus which switches the dedicated Nvidia 310M off when it's not needed. The low energy measurement figures confirm the high idle battery life. 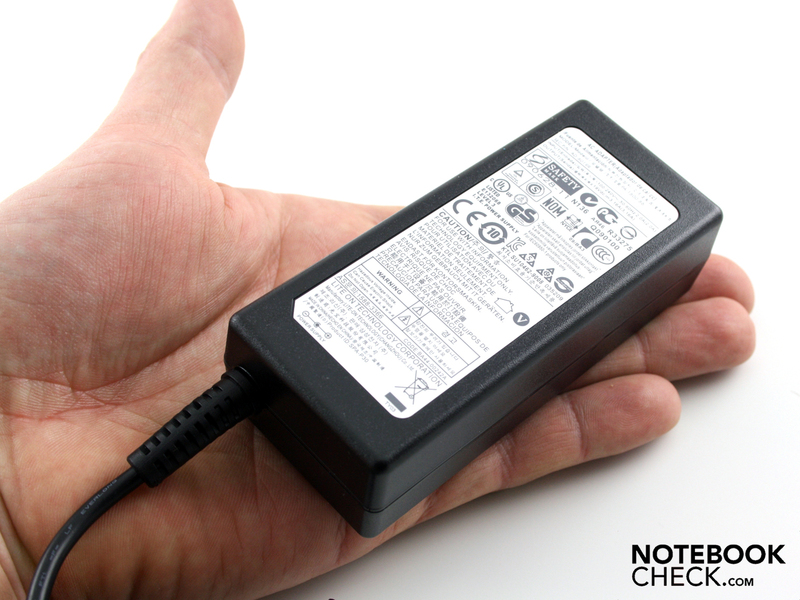 The Q330 scores with an idle power consumption of 11.1 watts. However, if you leave the high performance mode on permanently (CPU doesn't downclock, wireless on, maximum brightness), you have to count with 20.3 watts in idle. This rate is also so high because the above average brightness requires more energy in comparison to the QX330 (14.8 watts in idle). When Nvidia's 310M is busy with 3DMark2006, the effective power increases to 49 watts. The maximum power consumption in the stress test (Prime95 and Furmark) is 65 watts. The multimeter indicates a power consumption of 55 watts when only the CPU is under load. Thus, the dedicated GPU needs a maximum of 16 watts. The 60 watt adapter is slightly overburdened with the maximum consumption. This isn't a problem because our stress test scenario doesn't represent a real-life condition. 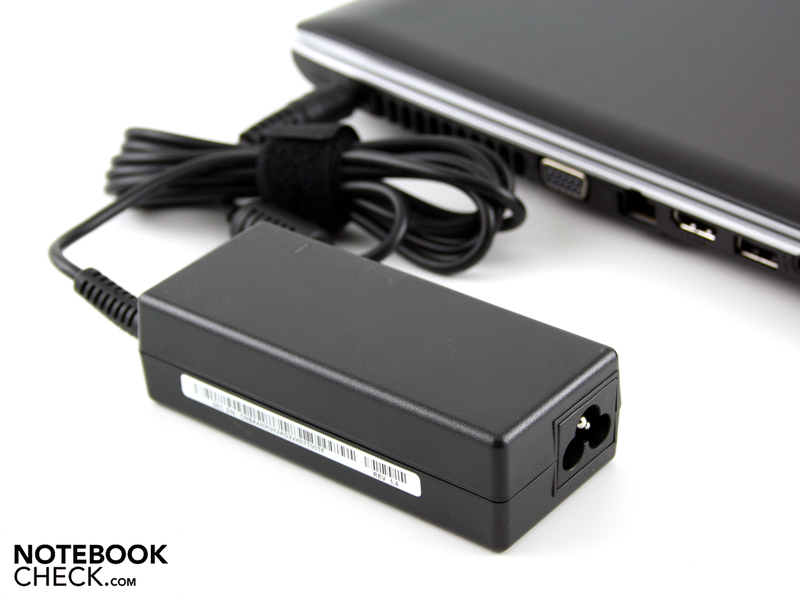 Apart from that, the adapter can easily cope with the excessive five watts of nominal power. 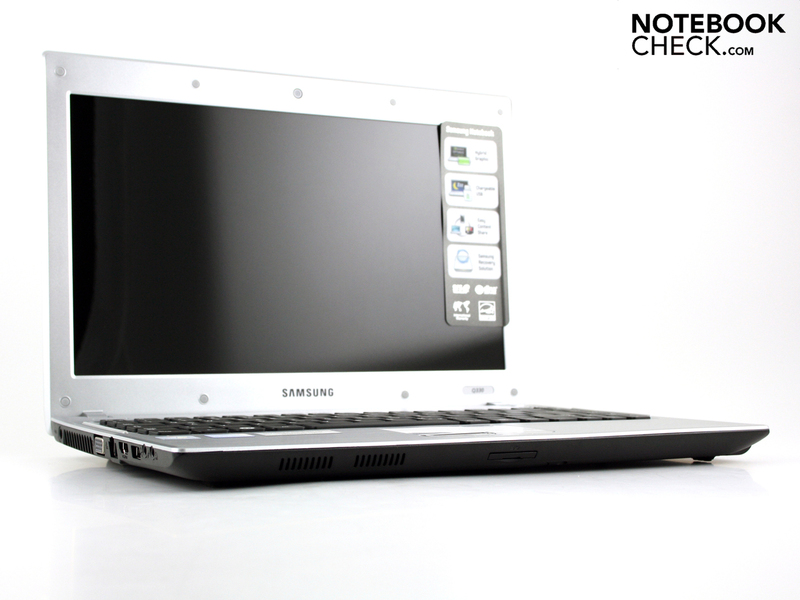 The Samsung Q330 Aura i3-350M Suri proved to be a simply designed office subnotebook with (limited) mobility advantages in our test. The battery life of four hours, the keyboard's good feedback, the silent operation and the seldomly achieved brightness (281 cd/m2) are decisive advantages. Unfortunately, the manufacturer ruins this bonus with a hardly glare type display hardly suitable for use in sunlight. The mini entry-level GPU, Nvidia Geforce 310M (512 MB) can be disabled via Nvidia's Optimus. The graphics isn't supposed to be a purchasing factor though. Current games will have a hard time (see gaming tests on the Geforce 310M's data sheet). In the end, its slim silhouette and the brushed aluminum looks could be purchasing arguments. The workmanship doesn't surpass the average in view of the selectively yielding case and the not completely tightly mounted hinges. 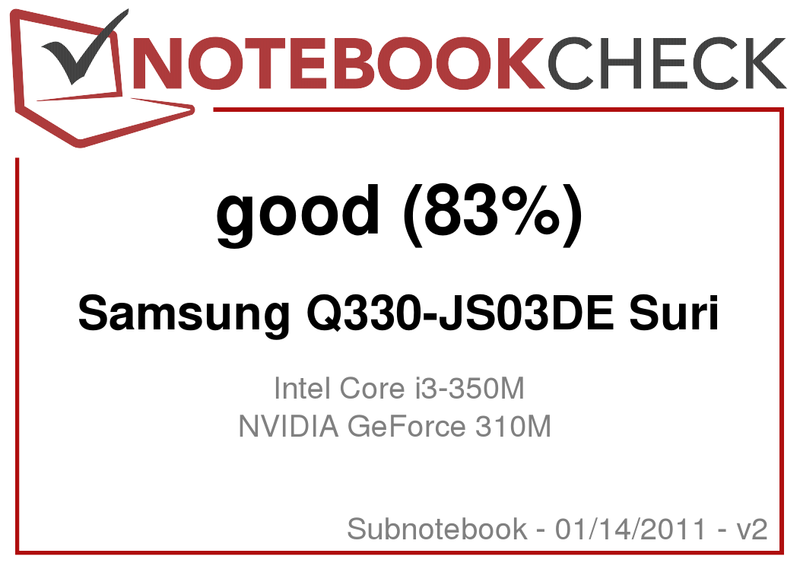 The Samsung Q330-JS03DE Suri (about 770 euros) is apt for office workers who are looking for a viable system performance in a handy size. Especially those who put value on a pleasant soundscape while typing and a good key feedback will find a suitable partner with the Suri. In terms of price, there is a range of less expensive alternatives. See "The competition" on the right. 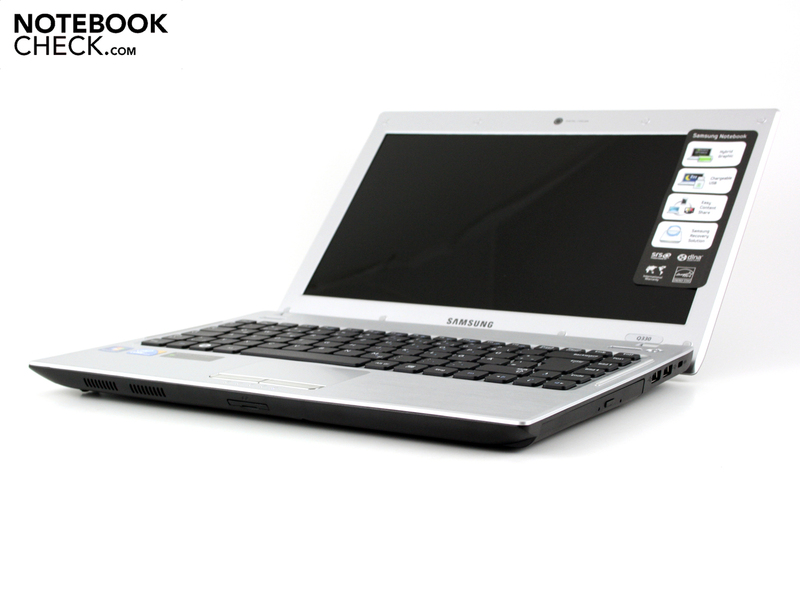 Samsung Q330 Aura i3-350M Suri (NP-Q330-JS03DE/SEG): good subnotebook with unbalanced mobile features. 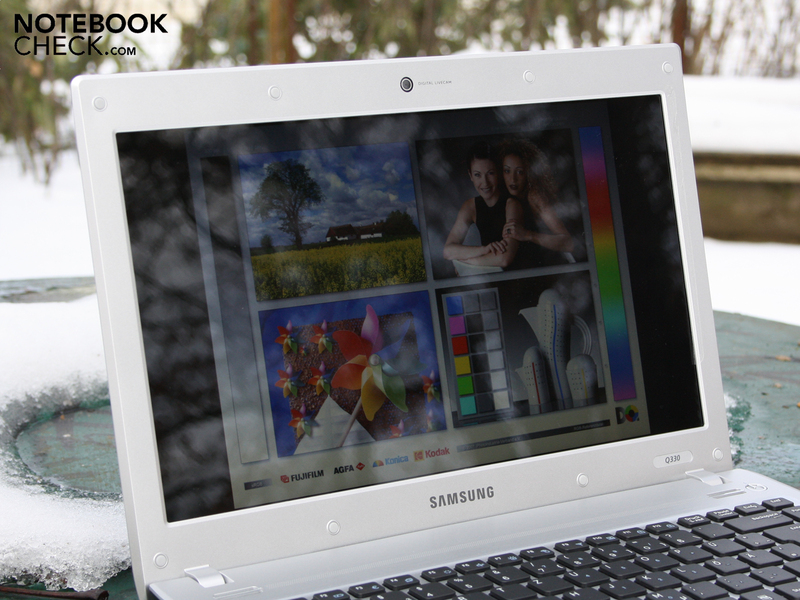 With the subnotebook through the winter. The interfaces are spartanic. HDMI is as good as it gets. The bottom is designed fairly homogeneously. It can be dented a bit in the center and over the optical drive. 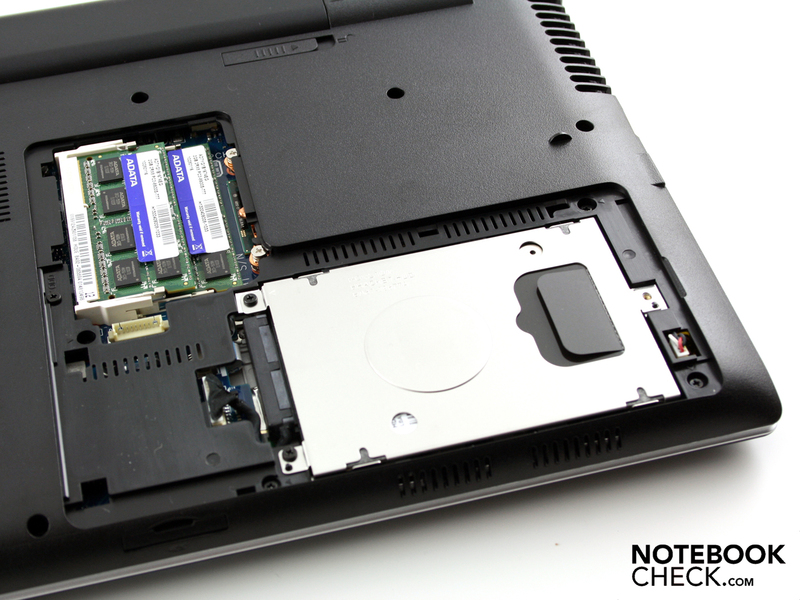 A large cover opens the way to the hard disk and RAM (two modules). The maintenance cover has been buffered over the hard disk. 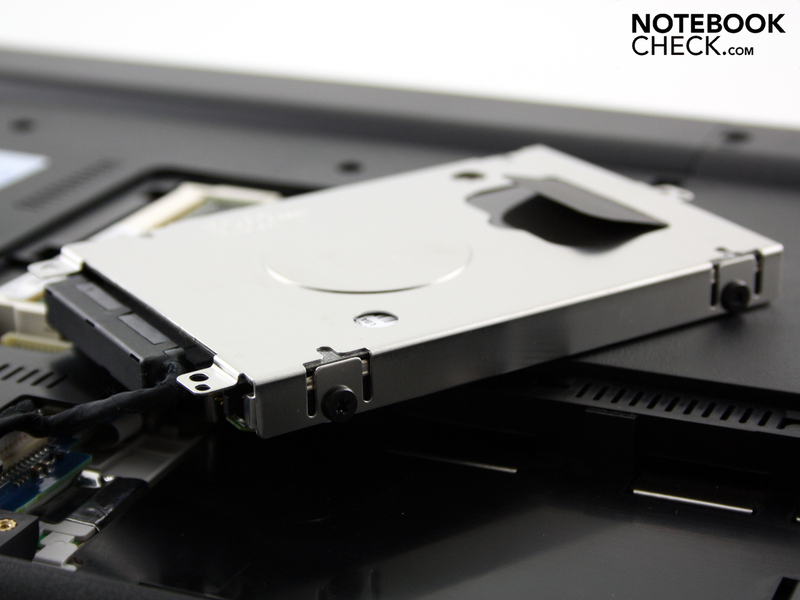 There are also flat buffers in the 2.5 inch HDD bay. Nevertheless, vibration protection will likely be limited. The small 60 watt adapter doesn't fit to the design. But it only weighs 247 grams. The performance is just enough for the maximum power consumption of 65 watts (only stress test). The battery no longer has an optical status indicator. It used to be standard for Samsung. The capacity of 66 Wh/ 5900 mAh is quite high. This is enough for four up to eight hours of mobility with the Q330. Air outlet and power socket are neighbors. The cooling is exemplarily quiet. The plastic surfaces in an aluminum look are brushed horizontally and thus have a good grip (power on). 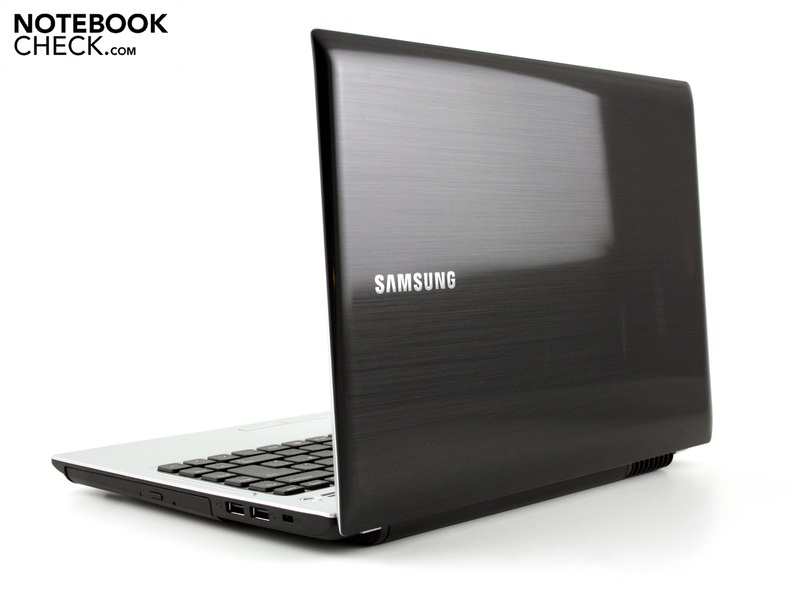 In review, the 13.3 inch Samsung Q330-JS03D with a Core i3 processor. 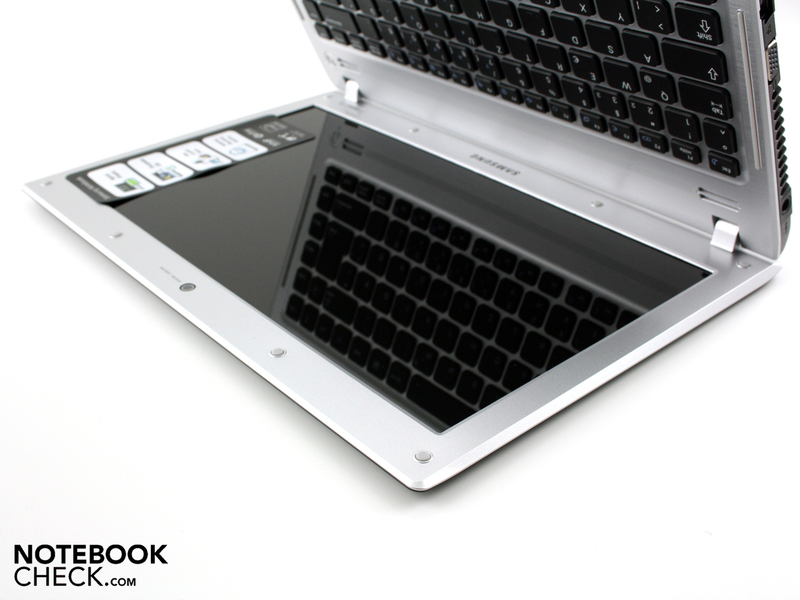 The 2 kg slim device is at the start with a price of good 750 euros. The matt inside is just a pleasing for pen pushers as for editors. The case isn't perfectly stable, but at least includes an optical drive. The hinges sit a bit spongy on the case, but adequately prevent the lid from teetering. The lid looks like a high-gloss component, but is slightly corrugated. This makes fingerprints less obvious. The glare type display doesn't really fit to the image of a mobile 13 incher. In return, the midrange hardware including Nvidia's Optimum graphics switching does. The looks are rather unobtrusive and simple (webcam). There are no DVDs included. The buyer has to burn his own recovery DVD via the Samsung tool. The haptic grip together with an almost always cool work surface. The well-known Silent Mode is at its best and the brightness is tremendous. Leave out the graphics card (incl. Optimus), give the display an AR coat and reduce the price by 100 euros. Why is a glare type screen bestowed with such good brightness? The technically possible mobility is reductio ad absurdum.